HOHENFELS, Germany — Alissa Grantham spent six years of her teenage years in the Hohenfels community and graduated from the Hohenfels High School in 2009. As an artist at heart, she grew up drawing cartoons and comics, which eventually led to her attending the Academy of Art University. Alissa graduated from university in May 2014. 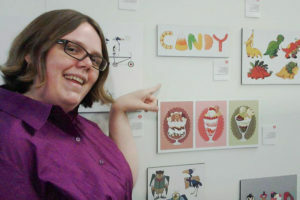 Her art has been featured at AAU’s Spring Show in 2013 and 2014. Alissa currently works as a certified freelancer and barista. And now, her illustrations are featured in a kids’ book, The Sea Monster, which was published this November and available at Amazon. I had the opportunity to ask Alissa some questions. I’ve been drawing for as long as I can remember, but I became a lot more passionate as an artist at around the age of 14. How did your parents, friends and members of the school support you? Everyone I’ve known has always been of great support! Whether it has been cheering me on for art class assignments or encouraging me to promote myself. I would like to give Hohenfels High School a big shout out for giving me the opportunity to attend Creative Connections twice. How did the author and you meet and decide to publish the book? The author was actually a friend of an acquaintance of mine who I knew her through an art class from college. The author was looking for an artist to illustrate her short story into a children’s book, and my style fit the most! It took a lot of trial and error, considering it was a first for the both of us, but now that they’re printed and selling it’s certainly been an experience for the both of us. Do you want to specialize in children books? Not particularly. It is something I do enjoy, and my style fits the genre really well. However, my preferences is in visual development for animation and video games. As mentioned prior, I prefer to work as a concept artist. Preferably as a character artist! However storyboarding would fair nicely as well. Working for companies like Dreamworks or Cartoon Network are definitely goals of mine. Are you planning a career in this field? Most certainly! Most of all I like to keep my mind open and available to do all kinds of jobs in the illustration department. Animation is the main part of my inspiration. My love for cartoons never went away as I got older, including animations made outside of the US (such as films from French animators as well as Japanese and Korean). Eventually my father would introduce me to video games and thus my inspiration only got bigger. Despite all this, I prefer to work as an illustrator. As I always say I like spending a long period of time on one drawing than several smaller drawings (in that case an animation).